Let me begin by saying, until the publisher changes the synopsis, do not read it as it has a spoiler that will ruin the book. I read the synopsis, and from the first chapter I knew what was going on, and further reading the book only proved it. I couldn’t help but wonder what reading the book would be like if I had not read the synopsis. I have omitted this supposed spoiler from the above synopsis. That one little sentence can change an entire outlook. 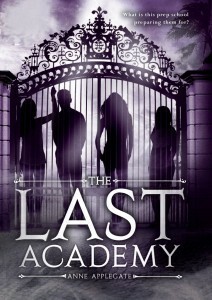 Camden is being sent away to go to a boarding school and she’s forced to make new friends... and enemies. She meets and learns of a man named Barnaby Charon who owns the school grounds, and when people end up missing, she’s set to investigate the creep. Strange things are happening at the academy, where it’s not only teaching class lessons, but life lessons as well. The first couple of chapters were quick and created a good ambience of mystery, humor and made the book relatable. That said, after those initial chapters, the book declined a bit into confusion for me. It started getting a little off-kilter with the series of events and there were no smooth transitions, and no real sense of time. This is probably how the author wanted things to go (all things considering) but it panned out as confusing for me. The way and the rate of Camden making friends and enemies seemed unrealistic as well. After about the 60% mark, the plot was phrased better and I understood more of what the author was trying to get across. At this point, if I hadn’t have read the synopsis, I’m sure I would have understood what was happening, what with Camden’s constant flashbacks and hallucinations. The ending was beautiful and brought tears to my own eyes. I suppose different people would react different ways towards this part depending on what they’ve personally went though in their own lives. Tears was my reaction. Good tears. The characters in The Last Academy are all relatable, I feel, towards someone everyone knows in their life. There’s the know-it-all Nora, the tortured-pretty-girl Bryn, the immature-stuck-up Tammy, and etc. The point is it represents different people and different personalities, and they all end up at The Last Academy with different reasons of being there. In all, I really liked the concept of the book, and how things played out, what with Camden being able to move on in a new school and experience love, loss and forgiveness. It was clever, and I would recommend it to those who want an atypical Young Adult suspense.